"When Adam Fisher was a youngster helping his father clean out drainage ditches, he’d wonder why there wasn’t a more efficient process. The traditional method then, as now, is to clean out the ditch with an excavator and truck the material away. For highway ditches, the bare earth left behind would then have to be replanted to prevent erosion issues. And at some point later, the process would all have to be repeated. 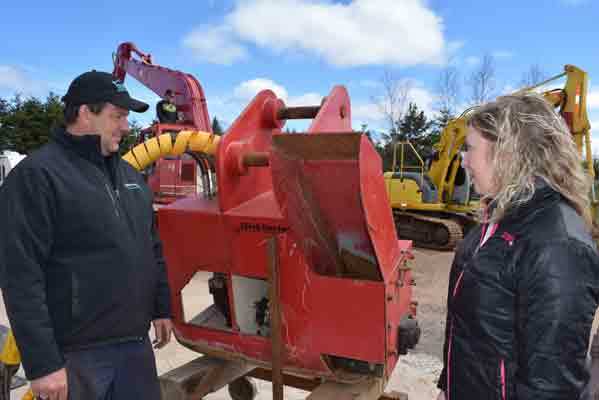 Adam and Carole Fisher of Glenholme are in the process of trying to market their Ditch Doctor, a piece of machinery that attaches to an excavator as a more efficient and environmentally friendly way of dredging out ditches. “It didn’t make sense to me, we didn’t have something to do a specific job,” the Glenholme businessman said, of his thoughts 30 years ago. Ditching and dredging became Fisher’s profession and despite continuing to operate in the traditional fashion, the prospect of creating a better way has stayed. In 2000, after much trial and error, he came up with a prototype for a rotary machine, called the Ditch Doctor, which attaches to the arm of an excavator. As the excavator moves parallel to the ditch, the machine, which has a sort of grinding wheel encased in a housing, spins up the material and blows it out, distributing it along the embankment. Because there is nothing on the market comparable to his creation, Fisher’s dream since creating the prototype has been to have it professionally manufactured. He has now reached that stage and wants to take it to the next level – generating interest with others in the industry.